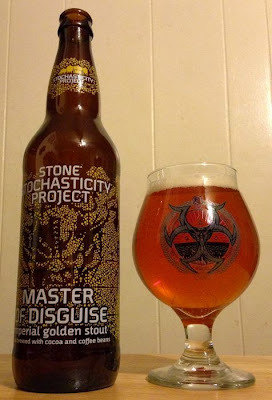 Master of Disguise is one of Stone's experimental brews from the Stochasticity Project line of beers. They bill it as an Imperial Golden Stout. 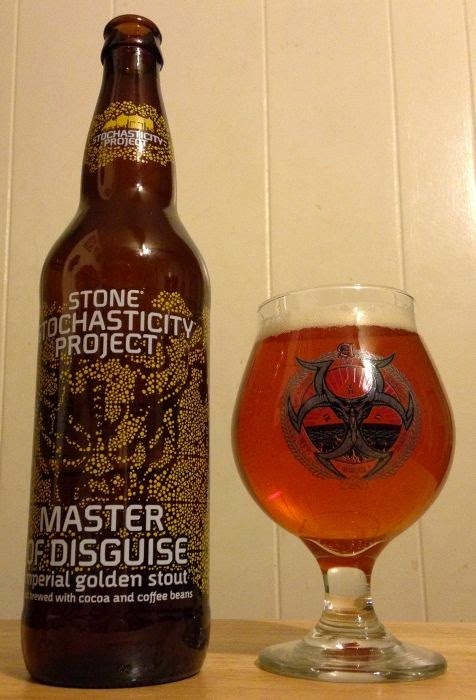 I bought it because Stone almost always does right by me, even when they try something that seems silly. Master of Disguise pours as golden in color as the name implies, with an average head that fades to a ring around the rim. The aroma is mild malt, peanut notes, a little bit of spice. And, damn if this thing doesn't taste like a stout. A little vanilla up front. Strong, rich, bitter coffee just floods the mouth in the finish, and the exhale is chicory and a hint of the nearly 10% ABV. This is more than just a novelty beer. I'd serve this after dinner to anyone.